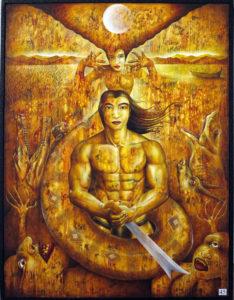 HANDIONG is one of the three main heroes of the Ibalon, widely considered to be an epic of the Bicol Region. Ibalon today exists in fragments. It is said to be transcribed by Franciscan missionary Bernardino de Melendreras, from which Fray Jose Castaño published a short fragment in 1895. Sixty stanzas, of the presumably 400, are only what is known today of the Ibalon. After Baltog, Handiong comes to Bikol and destroys different monsters and wild creatures. When not fighting them, he devotes himself to a domestic life, encouraging people to cultivate taro and building the first boat. His men invent implements and other things. Handiong and his men also establish towns as well as create laws. But the settlements suffer from great cataclysms as well as from Rabot, a fierce monster who was half-man and half-beast. Handiong entrusts the task of getting rid of Rabot to his close companion, the young warrior Bantong.